Dream Warriors – GHOST PARTY! Between towns, the adventure party was plagued by lucid nightmares. Were they shared hallucinations? Confused visions of the past and future? Or was it really just a dream? This post discusses the mechanics and story impact behind Episode 24 of Podquest: No Strangers to Adventure. Like, it goes in deep. Learn how this played out behind the screen and at the table, as well as how to run a session like this with your own party. Reading further may spoil events up to this point in our story! After an uneventful day following the only road through thick woods, the party’s ranger noticed movement in the trees. It wasn’t the flash of sun in the dappled shadows, as night was approaching. It wasn’t the flitting of tiny creatures like they’d seen all day, because this movement continued in the same direction, at the same pace. Someone was following them. Her eyes found his. It was her. She turned to face him. Even at this distance they locked eyes. She opened her mouth as if to speak. And hanging on long strings of spit, her teeth spilled out. Without a sound, she rushed toward the ranger. Shocked, he withdrew his gaze from his spying glass, and found, incredibly, that she appeared before him just as close as if still magnified. Her mouth curled back in a scream. Her hair impossibly flowing longer and longer behind her. The ranger awoke, drenched in sweat. His friends still asleep in their beds, in the room they rented for the night. He recalled everything about this dream, but when he told the others, it was their first time hearing the events. This experience was the ranger’s, and the ranger’s alone. If it meant anything more than any other dream, that was for the ranger to decide. As the dungeon master, devoting a session to acting out dreams can be a delicate balancing act. You want the player’s actions to have weight and the consequences to feel fair, but a dreamscape is also a great chance to play out impossible scenarios that can be a ton of fun for a lower level party (and can set up some atmosphere or undertones for your campaign moving forward). If you’re looking for a fun, single-session module that is pretty simple and can fit anywhere in your campaign, try this out! You, the dungeon master, are preparing a series of dreams that the players will enter. One at a time, each player character will have a dream that the other player characters are also in. Gameplay proceeds as usual: Players respond to their surroundings with actions and ability checks, combat still calls for initiative order, weapons and spells are used in the same way as always. The players may not even realize their characters are in a dreamscape for the first dream until they are told they woke up. This is where it gets dream weird: Everytime the player character that is currently hosting a dream makes an action or ability check, the DM will roll behind the screen to add a random element that transforms the current scenario in some way. A dream ends when the character hosting the dream would die in the dream, a predetermined number of d100 rolls has occurred behind the screen, or a predetermined number of rounds or actions has been met. The length of a dream can be as long or as short as the DM wants, but each dream should last around the same time or number of rounds. The dreams continue, either all in one night, or over a series of nights in an otherwise uneventful period, until each player character has hosted one dream. Session start: Everyone rolls d100 (to determine order of dreams). Player 1 has the highest roll. Player 1’s d100 roll applied to the random dream table is the first event of the dream. The dream is treated like a random encounter. Every time Player 1 does an action or ability check, the DM rolls d100 for the next dream element and introduces it into the current encounter. If the DM rolls the same number twice, they use the next number element on the table instead. The dream ends when one of the following conditions is fulfilled: Player 1 is just about to die in the dream; Player 1 has done a set number of actions; a set number of dream elements has been introduced. Steps 2-6 play out for Player 2. Repeat steps 2-6 until each Player has led a dream. There are a lot of ways you can adapt this basic framework to suit the needs of your campaign. This post will explain what the d100 and d20 rolls mean and how to create a random dream table. It also covers how you can make it a shared dream, a single dream, do without some of the rolls, change the duration of the dreams, and modify the contents of the dream to fit into your campaign’s setting. The core idea is simply incorporating a random d100 table for essentially a hyper-reactive random encounter. The only thing you’ll need to prepare as the DM is a random table for d100 dice rolls. For each possible number rolled, fill the table with a mix of dream components and elements from your campaign setting. During the session, you’ll be rolling a d100 for every action or ability check a specified player takes, or whenever you feel it’s time to spice things up. The elements from the campaign setting can be things your players have already encountered like felled enemies, recognizable NPCs, inventory items, the forest the players are currently trekking through, or details from players’ backstories. It can also be less tangible elements like a character’s love for their mother, the heat of engulfing flames, the laugh of the escaped villain, or the sensation of melting ice cream. Elements can also be things that have yet to be encountered in your campaign like a characteristic cave where a legendary amulet may or may not be hidden, the face of the ultimate Big Bad Guy, a phrase a wizard has yet to relay to someone, or a cute dog the party has not yet pet. The rest of the items in the table are dream components. These will be things that are truly random, that, at this point, have nothing to do with the campaign, but are on their own bizarre, exciting, or memorable. Dream components can be common dream subjects like teeth falling out, a long fall, driving an uncontrollable vehicle, or being chased. They can also be random qualities like a bright blue hue, a robot, laser beams, an octopus, quicksand, or a colossal carrot. Consider how these random things can contribute to the mood and theme of your campaign. When using the random dream table, cross off each element after it is introduced in the encounter. If you roll the same number twice, use the next element in the table instead. You don’t want to re-use dream elements. As to how you introduce the dream elements into the existing encounter, you might have to get a little creative. And you have to be okay with it getting as weird and wild as the items you wrote into the table. For the second dream in our session, I had rolled d100s to introduce magenta liquid, foamy beer, a beautiful pony from earlier in the campaign, a kiss, and the melting of ice cream, among other things. This manifested into a frothy, magenta ocean, from which a pretty pony beckoned, pulled in for a smooch, and melted into the ocean. I recommend listening to the episode to see how it meshed together with everything else. How you populate your table will determine how random or how story-related the dreams will be. Want a truly random set of dreams? Fill the table with things that don’t have any specific attachment to the campaign. Want the dreams to operate like a subconscious of the player characters? Put more campaign specific—and backstory specific—elements in the table. Want the dreams to be prophetic? Put in campaign elements that you plan on the story eventually incorporating. Want dreams to be prophetic but not so easy to decipher? Throw in a healthy mix of random dream fluff and campaign specifics so your players can’t tell what’s a vision of the future and what’s just dreaming. Is your campaign narrative heavy? If you want specific details to crop up in the dreams, don’t put them in the table! Just set them aside and determine which character you want to dream it, and you can start the dream with that element in it, or make a note to introduce it in that character’s dream at some point. Try to limit yourself to just one or two essential things, or else you’re not building a dream table, you’re just relaying a vision, which won’t allow for the players to be as dynamic and influential in the dream. For my random table, I had 50 elements that were an even mix of dream qualities that fit the tone of my setting, backstory events that were yet to be touched on, and things that the party had previously encountered. I had a chunk of the table just for backstory that would be specific for each player character. So my table had fifty items; the first item would be met with the roll of a 1 or 2, the second item with a roll of 3 or 4, etc. ; and ten items labelled backstory in the table that I had separate lists for depending on which character was currently having the dream. In a session for three players, I used thirty items on the table (or roughly ten items each dream) and the three dreams total took about two and a half hours. If you have a lot more party members, it might be a good idea to set the time limit on dreams to how many rolls are used on the dream table to ensure you have enough unique items for each dream and your session goes as long as you want. The difference between a normal day and a dream is one the players can’t see: behind the screen, actions the players make are also paired with a roll of a d100 that transforms the scenario in an unexpected way. The session begins with two rolls for each player: a roll of a d100 and a roll of a d20. Only the dungeon master knows what these rolls mean. The d100 decides the order in which the player characters will be hosting a dream. The player that rolled a 79 will get a dream before the player that rolled a 48. The same d100 rolls also determine the first random dream element that will kick off the events of the dream. The d20 decides the skew of overall difficulty of ability checks in each player’s character’s dream. You ever have a dream where you felt utterly helpless? Or a dream where you felt as powerful as a god? The skew of the d20 will determine, to a less dramatic effect, what kind of dream the character will have. At the start of each new dream, each player will roll a d20 that will determine how unstoppable their character is in that dream. If you want, you can also have that d20 roll be the initiative order in that respective dream. Rules for ability checks still apply. Rolling a 1 on a check is still a critical miss even if the player had rolled a d20 at the beginning of the dream. These DC modifiers can be scaled as need be to prevent a player from only having impossible checks or only critically successful checks. The idea is to make each dream feel like it’s own stand-alone experience, not kill the fun. Instead of DC modifiers, maybe initial low rolls don’t affect the ability check success chance, but the results come with not-so-great side effects. If the dreams are long, maybe go easy on the DC modifiers so every player gets a chance to do dream-warping cool stuff. If you want to try running a shared dream, the dream can last an entire session, or still be broken into different nights or segments as you see fit. In this case, you wouldn’t require the players to roll a d100 in the beginning. The d20 rolls before each dream would suffice. A shared dream means that every action, or set number of actions from all players will require a d100 roll to change up the dreamscape instead of just from the dream host. Just be careful if you’re planning a single dream, that a low-rolling player won’t end up frustrated from being unable to affect the dream! Maybe let the players roll a d100 after their action in this modified version. There are a few things to point out about the original campaign that our dream session is a part of. The party at the time was three level 2 characters. The dream session served as three days of uneventful travel to the party’s next destination. We largely follow 5th edition rules, but as a DM I love having my players roll d100s pretty often for plenty of random tables that don’t affect or alter how ability checks or combat works. Among the most common d100 rolls are what type of enchantment is imbued on their pet rock, and if they dreamed anything while they slept or meditated. Because my players have rolled a d100 before every long rest, they didn’t see it coming when the first night of the session became a dream they acted out. By the second night, they all knew it was a dream of a different player, and seemed excited to jump into this next unknown. The third night, the last player’s dream concluded with fire in the dream (an event from the player’s backstory) that became real smoke in the character’s lungs as the party woke up to the Inn they were staying at going up in flames. As a DM, I loved seeing how shook up they were with the dreams—asking NPCs if they’ve also had nightmares, trying to interpret meaning in the dreams, and trying to guess if there’s a DnD Freddy Krueger somewhere in the story. 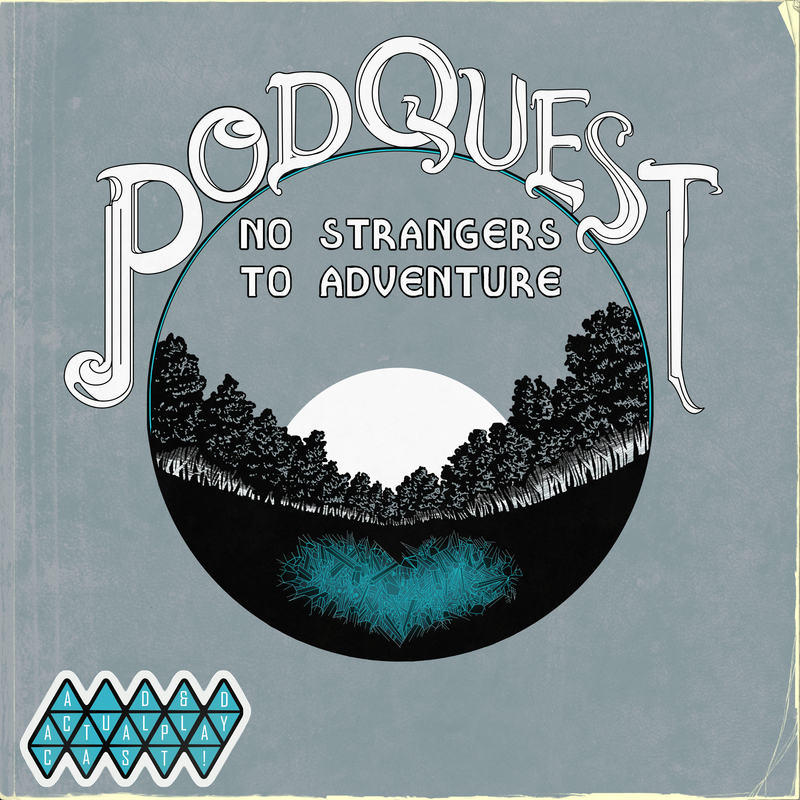 I hope this post was insightful into some of the goings-on behind the screen of Podquest: No Strangers to Adventure. If you have any questions or dnd related topics to discuss, our email is podquestnostrangers@gmail.com. And if you try this at your table, I’d love to hear about the crazy dreams that you brought to life!